This is what you'll carry in the future, so why delay the inevitable? 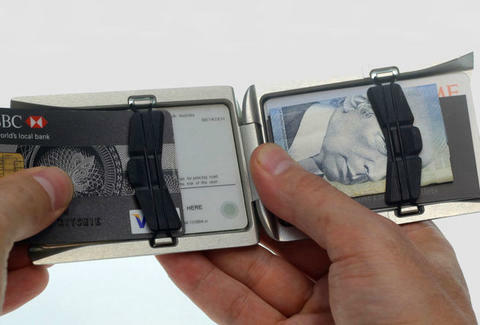 In the distant future, we'll all make purchases via retinal scan or rectal slam or dental dam, but in the nearer future, everything will be plastic, leaving natural fiber and animal skin wallets without paper currency as justification for their existence. Enter the aircraft grade, anodized Obtainium wallet. Machined to the hard, smooth dimensions of an old BlackBerry sleeve, this aluminum billfold is designed for quick access to its contents with or without having to open it. 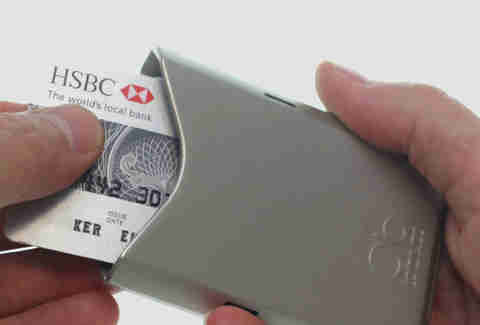 A strap-based insertion and removal system makes up to eight cards and some cash, or 10 cards and no cash, easily accessible. Meanwhile the softened edges of its exterior reduce wear on your pants pockets and adjoining organs.